87% of the population has a foot-related problem and their feet may not even hurt. Step Forward gives you two ways to make you and your feet feel better from the ground up. Painful heels, calluses, hammertoes, cramps, sore legs, sore feet, corns, back aches and bunions are only the symptoms of a bigger problem. Hard surfaces, improper footwear, old age and gravity are the major factors that lead to structural malfunction of the musculoskeletal system. When foot posture is incorrect the entire body structure is incorrect. 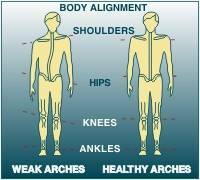 Weak or misaligned bones and arches can lead to painful conditions throughout the body including knee, hip, back, neck and shoulder distress. Most foot supports are made to fit the unbalanced or troubled foot. Step Forward's innersoles are made in the shape of a normal foot so that in time, your foot will conform to the shape of the orthotic. If worn properly the muscles and ligaments are realigned, thus eliminating fatigue and related discomfort. Our approach is this: The foot will change its shape from wearing improper footwear, therefore the foot can regain its balance or posture from wearing our well-balanced foot orthotic. Hundreds of thousands of people in Canada, the United States and other countries wear this type of orthotic. Step Forward's products are sold by doctors, orthopedic surgeons, chiropractors, osteopaths, physical therapists, and sports medicine clinics. Try one of our products today. We are sure you and your feet will feel better. The arches of the foot are formed by the combination of the bone and muscle structure. They consist of three arches: the longitudinal, metatarsal, and medial arch. 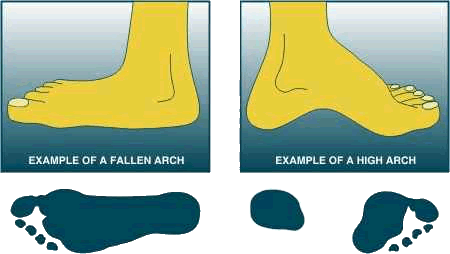 The largest and best known of the foots arches is the medial arch, which forms the hollow at the palm of the foot. The smaller lateral arch, on the outside of the foot, lies parallel to the medial arch. The metatarsal arch reaches across the foot immediately behind the toes.